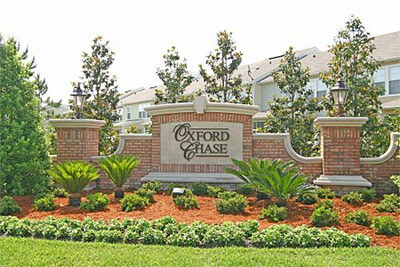 Oxford Chase Townhomes in Jacksonville, Florida. Conveniently located in Southside area on Gate Parkway near Tinseltown, Oxford Chase is a gated community with 250 townhomes featuring a clubhouse with meeting room, swimming pool, and fitness center. Enjoy the luxury of three impressive townhome floor plans with two-car garage, all located inside a gated community. Oxford Chase is close to interstates, shopping, fine dining, entertainment and the beaches. Call today at (904) 307-8998 for your personal tour of the community. The Yardley plan features 9' ceilings, eat-in kitchen, downstairs library, fireplace with custom wood mantel, 2-car garage, separate dining area, dramatic 2-story foyer ceiling and a covered lanai.